I am a planner by nature. I like schedules and plans, in fact I need them. I feel like life goes much more smoothly when I have a plan and can see it on paper. The busier my life gets the more I feel like I need a planner. I would go crazy without my planner. From my menu plan, to my blog planner, from my to do list, to my home school schedule, from my grocery shopping to my work schedule and to do list for my husband’s office, I would never be able to keep track of it all without planning it out. The trouble I have had with planners though is none of them work for me. I would end up only using part of a planner and the rest would just be wasted space, but I do not like wasted space and empty pages. Last year I put together my own planner of sorts, using some forms I put together myself. This worked okay for me, but it was a bit messy, and still not quite what I wanted. I wanted forms and planning pages that I could customize and make work how I wanted. That is why I was thrilled earlier this year to find out that my friend Jessica was working on an Ebook and planner. She felt the same way I did about planners not working for her, and she decided to put together a planner that people could customize. You can print out only the pages that you need. No more empty pages that don’t work for you taking up space in your planner. Not only that, you can customize many of the pages before you print them out and put your planner together. Also, what Jessica put together is much more than a planner. She has many tips and ideas for organizing your home and life, and information on how to put together a household notebook. Last week Jessica sent me a copy of this Ebook/planner to review, and I instantly loved it and started customizing my pages and printing them out so that I could put together my planner for 2011. If you like plans, schedules, and lists like I do and have struggled to find a planner that works for you, then I think you will love this. I am not receiving anything for posting this. I am not an affiliate. This is truly a product and idea I love and thought that many of my readers would enjoy it. 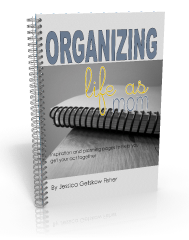 If you would like more information on this Ebook/planner please read the full details on Jessica’s site.